Mmm, interesting location (which some of you may be familiar with, HI CONOR). But you do what you can to get an outfit picture. I quite like the old-lookingness* of the Stalls sign. The best part is that a girl walked in to use one as we were taking this picture. I beat you all at Most Awkward Blog Picture Taking Moment. The shirt I bought at a record and vintage clothes shop in Saratoga, the tights are my sister's, and the belt is from Goodwill. I'm wearing the shirt backwards so it's black and white, but the front of the shirt is so fantastically 80's ugly with the colors and font and country singer girl with a curly Don't Tell Her It's Me (awesome bad movie) mullet. Not really my favorite outfit because I feel like I've taken TOO much inspiration from street style sites with it, meaning it's kind of too simple for my taste and not in the mysterious cool margiela way. But, that'll do pig, that'll do. 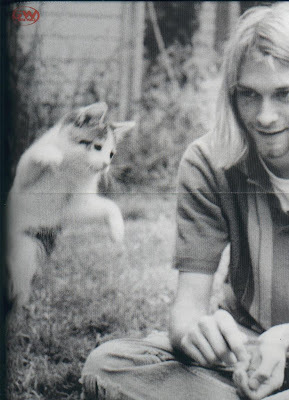 And a picture that Isabel already posted but I love and have printed out and taped to my wall (true story): Kurt Cobain and a cat. A dancing cat. And our Rodarte buddy here looks like he's in a distracted trance. Epic.